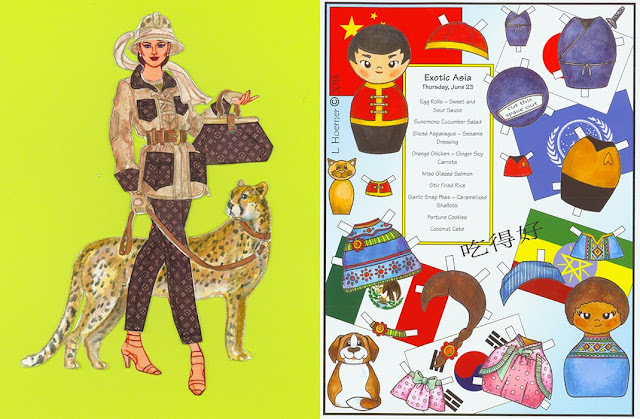 The 2016 Paper Doll Convention, hosted by Jane Alfano Rasor, was enjoyed by more than 80 enthusiastic collectors, dealers and artists. 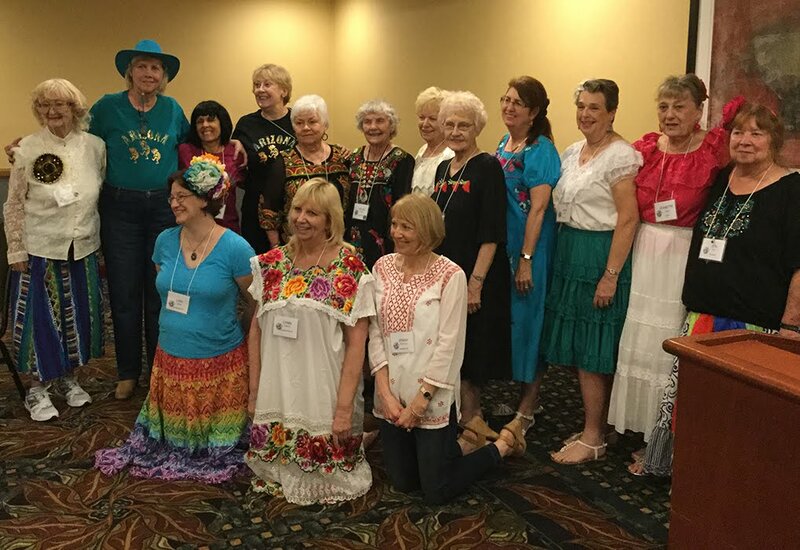 Many attendees were newbies who live locally and hadn’t before experienced the fun and friendship that always blooms at the annual paper doll conventions. Because there were slightly fewer people, I had more of a chance to visit, to socialize and spend more time getting to know people better, and I liked that a lot. The fun began with a museum visit and bus tour, followed by a “Fiesta” themed party including a delicious Mexican buffet, the first of the banquets including Italian, Asian and French feasts, each one commemorated with a “Small World” menu by Linda Hoerner. The following three and a half days were packed with informative and entertaining presentations and instructive workshops, plus a day of selling and the ever-popular raffle (bigger than ever!) and an exciting silent auction. 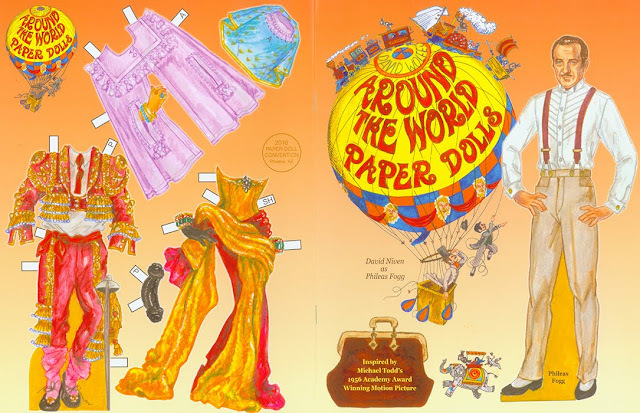 As always, the souvenir paper doll books especially created for the convention are collectible reminders of a good time had by all. A red tote bag was presented as attendees registered and in it was a coloring book by Shannon Finch, “It’s a Mod, Mod European Tour.” The first souvenir book distributed was “Miss Paper Doll World,” an imaginary beauty competition with each entrant a paper doll by Alina Kolluri, Gregg Nystrom, Ralph Hodgdon, Brenda Sneathen Mattox, Diedre O’Tierney, Patricia Corte Rooney, Eileen Rudisill Miller, Larry Bassin and Kwei-Lin Lum. 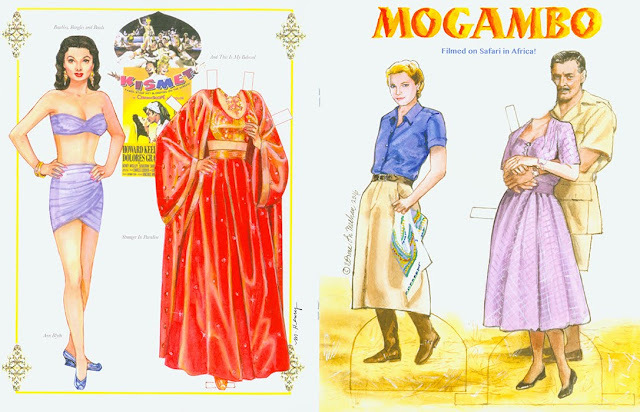 The next evening’s souvenir featured paper dolls starring in movies with foreign themes. 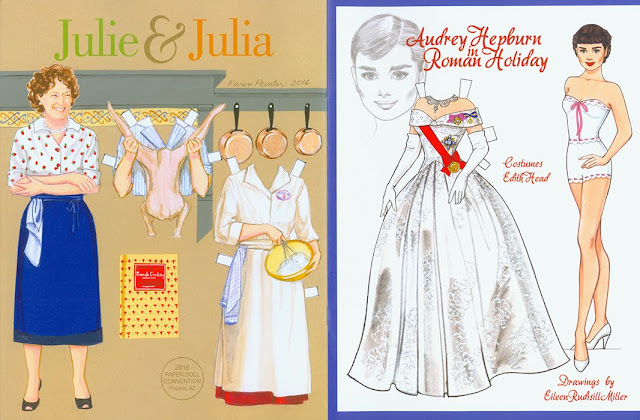 “Roman Holiday” by Eileen Rudisill Miller, “On an Island with You” by Ted Menton, “Kismet” by Marilyn Henry, “Mogambo” by Norma Lu Meehan, “Anna Karenina” by Bruce Patrick Jones and “Julie and Julia” by Karen Hunter. My Outfit dressing Rudy’Dress-a-Doll and Linda’s Asia Menu. Linda’s Paris and Italy Menus. Kwei-Lin’s Beauty Queen and Miss Paper Doll World Book Cover. Beauty Queens by Brenda Sneathen Mattox and Diedre O’Tierney. 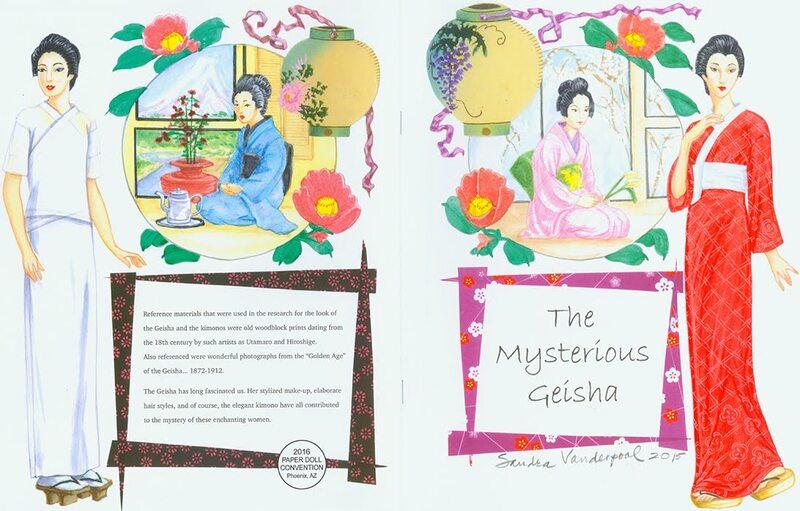 The Mysterious Geisha by Sandy Vanderpool. 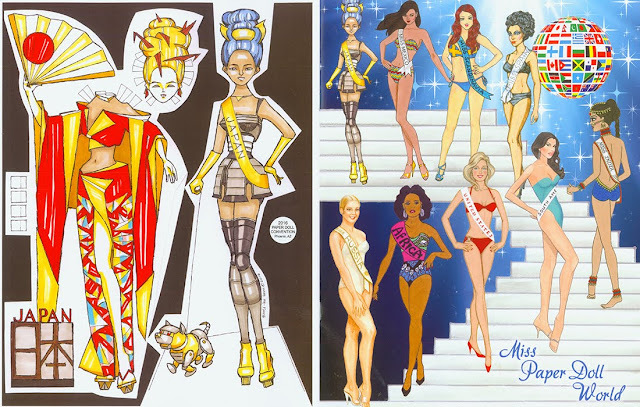 Meryl Streep by Karen Hunter and Roman Holiday by Rudy Miller. Kismet by Marilyn Henry and Mogambo by Norma Lu Meehan. 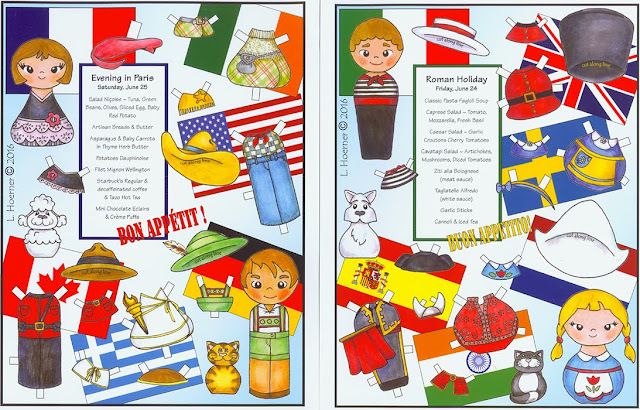 Paris Dior Cover and Dolls by Jim Howard. 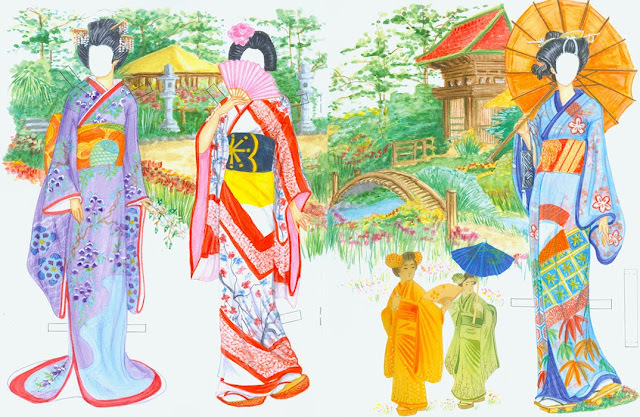 Dior Creations by Jim Howard. Around the World in 80 Days Cover by Me. 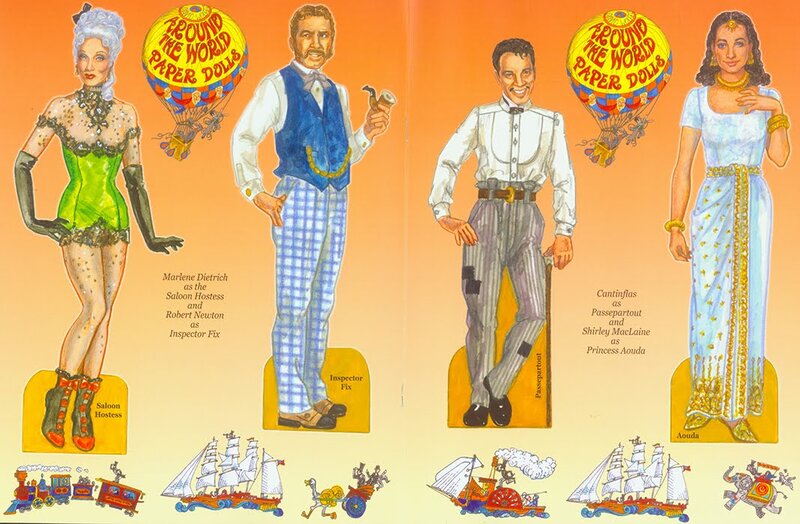 Character Dolls from Around the World in 80 Days. A growing tradition at the paper doll conventions is the fun of playing dress-up in an outfit expressing each evening’s theme. 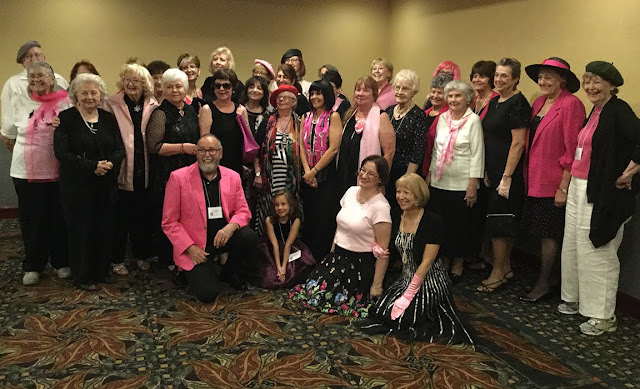 What originally began as a Saturday evening fancy frock opportunity is growing and in Phoenix even Jane Alfano Rasor’s delicious banquets reflected the fun themes. 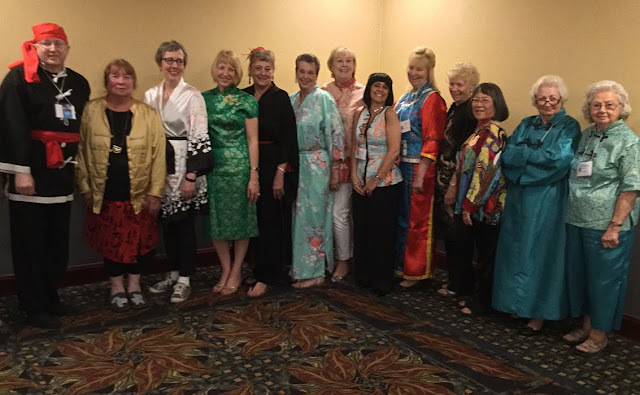 “Fiesta,” “Exotic Asia,” “Roman Holiday” and “Evening in Paris” brought out the inner fashionista of many conventioneers. Dressing-Up for Evening in Paris. 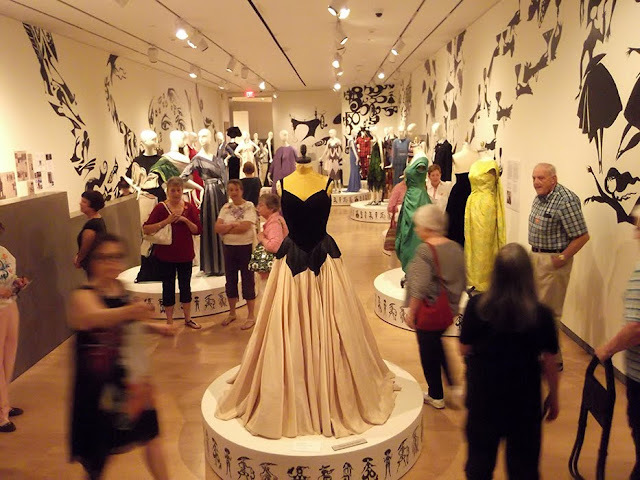 The convention kicked-off with a visit to the gorgeous Phoenix Art Museum where we enjoyed a docent-guided tour of a special exhibition that displayed a brilliantly curated selection of 50 important gowns from the museum’s vast vintage collection. 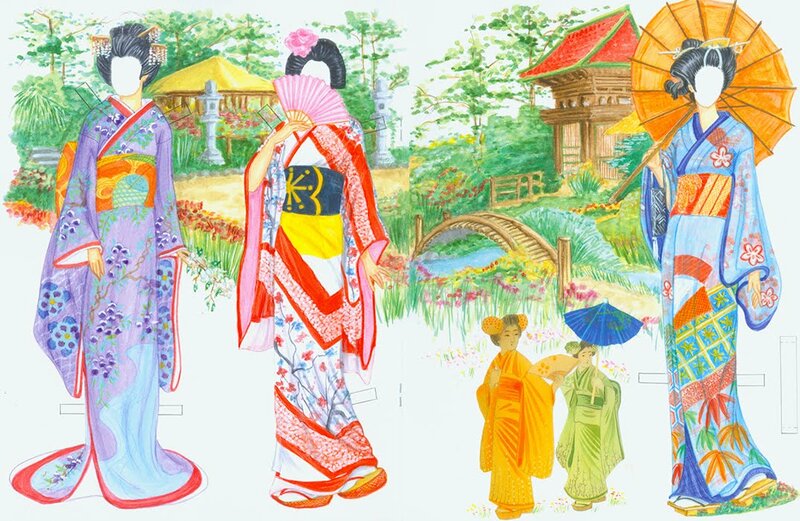 Many wealthy women of the desert city are patrons of the Museum and donate funds as well as their own couture creations. The exhibition occupies two galleries that had been decorated with whimsical fashion silhouettes by artist Ruben Toledo (husband of designer Isabel Toledo). 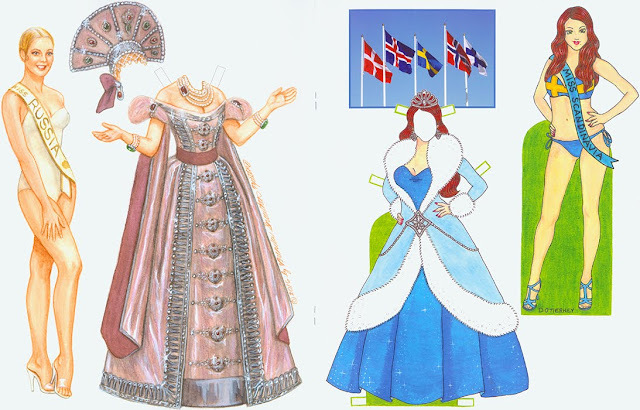 Beginning with several beautifully preserved 18th century highly ornamented confections, the changes in silhouette from then-to-now were carefully charted. 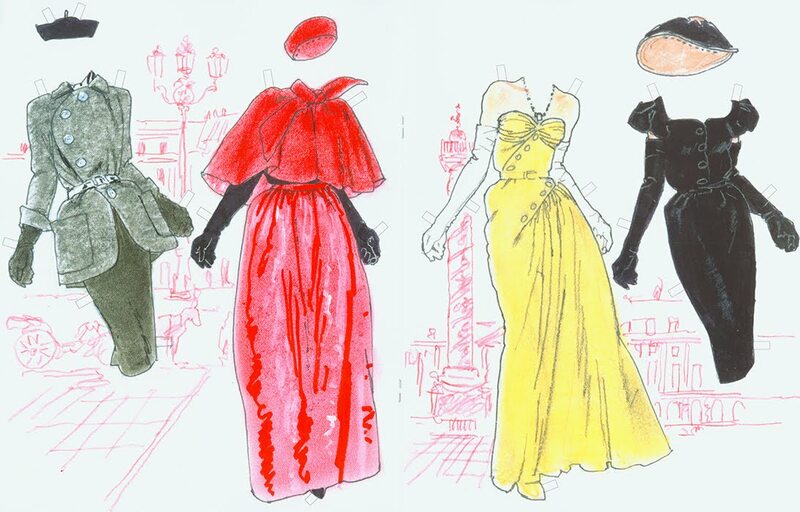 Starting with a gown by Charles Fredrick Worth (history’s first designer to put his name on the label), the exhibition is like a Who’s Who of designer names including Fortuny, Vionnet, Chanel and Schiaparelli. The second, larger gallery positioned a Charles James creation as the focal piece and followed it with Dior, Ardrian, Valentina, Saint Laurent, and Givenchy among others. Charles James gown at Phoenix Art Museum Exhibit. Murals by Ruben Toledo and Gauntlets, 1650, the oldest item in the Museum’s collection. Decorative Trims on 18th Century menswear, 19th Century Worth gown, 20th Century Schiaparelli suit. Pamela Colbin has written an unusual book, “Couture Confessions: Fashion Legends in Their Own Words.” It is a clever cut-and-paste compilation consisting of many interviews given by legendary fashion designers. The result reads as a revealing portrait of the real person behind the famous labels, eleven fascinating personalities from Paul Poiret to Alexander McQueen. The author even has created an imaginary “round table” discussion between several superstar talents. The book is brilliantly illustrated with portraits by Yann Legendre, graphically bold artwork that imitates wood-cuts. Available for $23.66 on Amazon.com. A sampling of designer quotes… Paul Poiret: The avant-garde designer…such as myself…has to have his wits about him. He must be tenacious and farsighted. It’s not always easy! Coco Chanel: Few designers have been copied as much as I have, and it has always given me great joy. I always side with the majority. 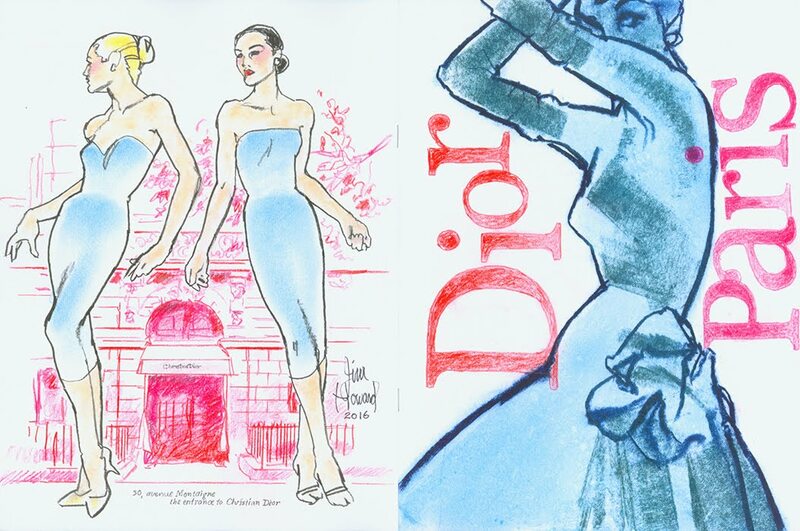 Christian Dior: A fashion devoid of a certain poetic resonance is worthless. 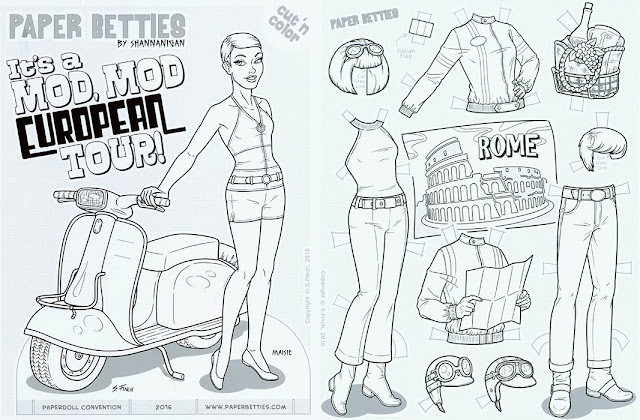 All the fashions I have created have come from the heart. Alexander McQueen: I like blowing people’s mind. It’s a buzz. Like a fix, for twenty minutes. Fashion should be a form of escapism and not a form of imprisonment. CoCo Chanel, Elsa Schiaparelli and Christian Dior.